We are pleased to announce that Somerset Crafts, based at the Avalon Marshes Centre, has re-opened after extensive refurbishment. The Craft Centre has been closed since January 1st and is now transformed. Why not come and visit and see the wonderful arts and crafts of the Avalon Marshes? The building is owned by Natural England and has had a total makeover thanks to funding from Defra and the hard work of Natural England’s contractors Kier Services. 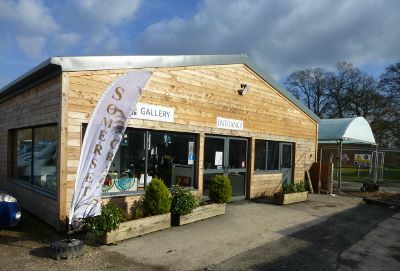 The inside has also been transformed by the hard work of the artists and craftspeople of Somerset Crafts, they have put their efforts into a different kind of painting with the interior of the gallery being completely re-decorated! It now has a fresher, lighter look. Somerset Crafts comprises of 22 different artists and craftspeople who display and sell their work at the gallery. This work includes stained glass, jewellery, mosaics, oil, acrylic & watercolour paintings, photography, handmade soaps and beauty products, stone & slate sculpture, textiles, furniture, wood working & wood turning. All the products are unique, original and locally hand crafted of exceptional quality and value for money. Why not visit their website or better still visit the Avalon Marshes Centre itself? Teas, coffee, cakes and biscuits are also available most days. Thanks to the Defra funding Natural England’s contactors are pushing on with other works at the centre. By the end of March staff will be moving into new offices and the old life expired ones will be demolished. This will increase car parking space and open up views of the replica Romano-British building and Anglo Saxon hall. These are built by South West Heritage Trust’s Hands on Heritage Volunteers and have been largely funded by the Heritage Lottery Fund. We would add that the Natural England’s site team would like say a huge thank you to Tony Ford, Craig Taylor, Ian Hunt of Kier Services and all their sub-contractors. They are working flat out to get all of the current works completed by the end of March.